Diva Devotee: [Review] Paloma Faith- "Picking Up The Pieces"
[Review] Paloma Faith- "Picking Up The Pieces"
At the Brits you said you had mixed feelings about your debut album. What did you mean? The first time round, I knew what I wanted but I didn't necessarily have the confidence to stick to my guns. There was a certain degree of manipulation because I felt indebted, somehow, to the record label for signing me. I'm not entirely convinced this is true, instead I think she's seen the success that other female singers have had with their "maturer" sound, and has decided she wants a piece of that golden pie. Whatever the case, the new single Picking Up The Pieces definitely sounds more grown up. Vocally, the "jazzy" inflection she was so fond of on her last album- see New York Upside Down- has been eliminated, "Praise Jebus", and instead we are left with a direct, honest, pop delivery. It works well here, holding its own, and standing apart, from the rich production, and ultimately allowing for the lovelorn lyrics to be understood and appreciated without the distraction, and annoyance, of the contrived vocal persona of her previous songs. 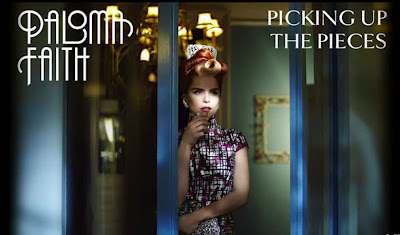 This is a fresh start for Paloma Faith, and I think I might actually like her second time round. Picking Up The Pieces is released on 20 May, and second album, Fall To Grace, is out the following week . She's going to be one of the assistant coaches on The Voice I think? Not sure whose team though, perhaps Jessie's? yikes...I'm not sure what to think of that. Suppose I'll just wait and see. Cerys from Catatonia is another one! I, like yourself was not hot on the debut material infact I cant even think of how the songs go lol I do like this though, her vocal seems less cheesy! where are you getting this info from? Mystic meg? I found her debut persona to be really grating tbh. I'll reserve real judgement till the next single! The out there persona is not really a persona its kinda who she really is. She used to participated in burlesque shows around new York. So that explains her fashion statements and style of music and image.